The people listed in Canadian Who’s Who are highly accomplished, and have outstanding careers. It is an honour to speak with them, if you ever get the chance. Canadian Who’s Who in Conversation brings these people to you live, to your tea table, local library or folk festival, giving you a glimpse of who they are and how they came to prominence. Who are the Whos? Let us show you. Brian Dalrymple chats with Canadian Who's Who to discuss the Zapruder film as a forensic tool, using lasers to detect fingerprints, and being in the same book as Wayne Gretzky. Are you a fan of shows like CSI? If so, you have Brian Dalrymple to thank for developing some of the technology the CSI team uses. Canadian Who’s Who chatted with forensic consultant Brian Dalrymple following a talk he gave at the Orillia Public Library in Orillia, Ontario. We learned that the technology Mr. Dalrymple developed has influenced police services around the globe, that thanks to his work the Ontario Provincial Police have become leaders in the field of forensic science, and that he is honoured to be in Canadian Who’s Who with Wayne Gretzky. Though he began his studies at the Ontario College of Art and Design, Brian Dalrymple is most known for his revolutionary work in forensic science. In 1977 through collaboration with the Xerox Research Centre of Canada, Mr. Dalrymple developed a new non-destructive method of detecting fingerprints using an argon laser. As a result of this work the OPP became the first police agency in the world to make us of this technology. Today use of forensic light sources is a key component of forensic identification. Not to be outdone, after 10 years of research, Mr. Dalrymple again made an important advancement in technology with the application of computer enhancement technology to evidence images. Through computer enhancement, he found he could detect crucial details of evidence that traditional photographic and analog techniques could not reveal. Retired from the OPP since 1999, Mr. Dalrymple now consults for clients throughout Canada and the United States assisting in computer enhancement techniques, fingerprint detection, forensic light source technology, and photographic evidence analysis. He is the recipient of several prestigious awards, and the author of numerous publications, including Crime and Measurement: Methods in Forensic Evaluation. The law-abiding public can sleep well knowing that Brian Dalrymple is on their side. Lennie Gallant and Murray McLauchlan tell Canadian Who's Who about being pinned as Members of the Order of Canada, discuss being musicians in Canada, and reveal who taught Colonel Chris Hadfield the chords to "Space Oddity". 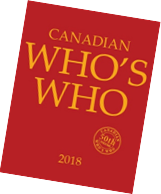 To say that Canadian Who's Who biographees Lennie Gallant and Murray McLauchlan are part of the canon of Canadian music does not begin to sum up the breadth of their careers and their contribution to culture in Canada. Canadian Who's Who was fortunate enough to sit down with these two gentlemen at the Mariposa Folk Festival, the grand dame of Canadian folk festivals, in 2013. Born in Rustico, Prince Edward Island, Lennie Gallant is recognized by his peers as one of Canada's best performing songwriters. Because of this, it should come as no surprise that over 30 artists have recorded his songs, including multi-platinum artist Jimmy Buffett. Mr. Gallant has 10 albums and numerous JUNO and East Coast Music Awards to his credit. In the true spirit of representing the fabric of Canada, though he grew up speaking English, Mr. Gallant has held onto his Acadian roots, releasing two French-language albums, one of which, Le vent bohème, won him the Francophone Album of the Year at the 2003 East Coast Music Awards the same year he was made a Member of the Order of Canada. With a career that began in 1965 in Toronto's Yorkville coffee houses, Murray McLauchlan has appeared on many stages, and has played with the likes of Gordon Lightfoot and Joni Mitchell, performing for the first time at the Mariposa Folk Festival in 1966. Mr. McLauchlan’s 18-album catalogue has been well received by the listening public, earning him 11 JUNO awards (including Composer of the Year, Folk Singer of the Year, and Country Male Artist of the Year), RPM Big Country Male Vocalist of the Year, and an appointment as a Member of the Order of Canada. Active in philanthropic circles, Mr. McLauchlan also holds a commercial pilot’s licence, and for the Gemini Award-winning Floating Over Canada, he once piloted a Cessna 185 float plane across the country, visiting and performing with notable Canadian musicians from coast to coast. Singer/songwriters Lennie Gallant and Murray McLauchlan sit down with Canadian Who's Who at the 2013 Mariposa Folk Festival in Orillia, Ontario, to talk about their Mariposa experiences, playing in "folk nirvana". Three expert Canadian food consultants and cookbook authors met in Orillia, Ontario, recently, and Canadian Who’s Who was there, serving the tea and cookies with the camera rolling. Dorothy Duncan, Elizabeth Baird, and Rose Murray have all had careers that have brought them to prominence in the field of Canadian cuisine, writing about Canadian cooking and the history of food in Canada. When these three remarkable women met the public at Manticore Books, Orillia, and had tea together afterwards, they were far from meeting for the first time. Their work has overlapped in various ways, and they met to celebrate the publication of Canada's Favourite Recipes, by Ms. Baird and Ms. Murray, with a contribution from Ms. Duncan. Dorothy Duncan, who lives in Orillia, had an honoured career as a curator, advisor and supervisor of museums, galleries and heritage sites across Ontario before turning to authorship. Listing membership in the Order of Ontario amongst her other honours, she has now written four books about Canadian cuisine and conditions of life in early Canada. Her most recent is Hoping for the Best, Preparing for the Worst: Everyday Life in Upper Canada, 1812-1914. Elizabeth Baird, named to the Order of Canada in June, 2013, for her contributions to the promotion of Canada’s diverse food heritage, was the food director of Canadian Living Magazine for many years, and is responsible for more than 20 cookbooks published by that company, as well as for classic books of Canadian cuisine that she has published independently. She has influenced a generation of chefs, including Jamie Oliver, is a Food Network host, holds a national award for food writing and was a founding director of Breakfast For Learning. Rose Murray has studied cooking around the world. She once owned a cooking school and has taught cooking across the country. She has appeared on numerous radio and TV cooking shows, acting as a consultant and recipe developer for food companies and government boards and ministries. She has a long and much-awarded publication history of her own cookbooks and has contributed to more than 40 books. As a writer for Canadian Living Magazine, among many others, she has worked with Ms. Baird before their joint publication of Canada's Favourite Recipes.